The Step Diet is written by James Hill, John Peters, Bonnie Jortberg, and Pamela Peeke and is promoted as a life-long program for weight loss and weight maintenance. James Hill is an obesity researcher and co-founder of the National Weight Control Registry and all the authors are weight-control experts from the University of Colorado. The book proposes that dieters can lose weight effortlessly by slowly increasing their physical activity levels. Hill claims that dieters do not need to engage in strenuous exercise in order to lose weight. Simply walking combined with minor dietary adjustments is sufficient to produce results for the majority of dieters. 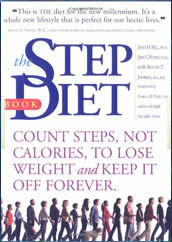 The Step Diet is based on the basic concept of ‘move more, eat less’. Dieters are told that if they walk 10,000 steps each day and cut down portion sizes by a quarter they will lose weight easily. Upon commencement of the program dieters walk 2000 steps each day and this is gradually increased throughout the 12-week program. There are no forbidden foods and dieters can eat whatever they want as long as the portion sizes are reduced by 25%. If dieters wish to enjoy their favorite high calorie foods they advised to compensate by increasing the number of steps they take on that day. The book includes detailed charts, which make it simple to calculate the number of steps required in order to burn off the calories from an indulgence. Dieters are also provided with general diet guidelines as well as tips on how to reduce calories and portion sizes. Find healthy recipe ideas here. Fruits, vegetables, whole grains, low fat dairy, lean protein and healthy fats. Dieters commence with 2000 steps daily and eventually build up to 10,000 steps, not necessarily all at once but over the course of the entire day. The Step Diet also includes information for other physical activities that may be substituted for walking and the amount of steps they are equivalent to. For example one minute of yoga is the same as 50 steps so a one-hour yoga class equals 3000 steps. These exercises can also be used with the Step Diet. The Step Diet retails at $22.95. Does not require dieters to make dramatic changes in what they eat. Book comes with pedometer, which is valued at $20. Good for those who prefer not to follow strict plans. Allows dieters to lose weight gradually so as to avoid the risk of rebound weight gain. Addresses the psychological issues regarding dieting and weight management. Based on scientific research and studies. Lacks information regarding food quality. Potential for dieters to make poor food choices due to the lack of specific eating guidelines. Dieters may not be able to accurately assess if they are cutting calories especially if high fat foods are consumed regularly. The Step Diet provides a simple approach to weight loss that is concentrated on achieving steady results that will easily maintained over the long term. It will appeal to dieters who prefer not to follow a specific meal plan and do not want to change the way they eat significantly. I’ve never been able to stick to a diet plan for longer than a couple of weeks. I hate being hungry, and I hate exercising. But guess what? I’ve stuck with this for 8 weeks now and I know I’ll be able to continue this for the rest of my life. This isn’t quick and fast. It’s hard work but it’s so worth it. I’m losing on average 1.5 pounds a week and 1/4 to 1/2 inch off my waist per week. I’m walking every day and it doesn’t feel like the diet is taking over my life. I watch what I eat and eat what I want, although I don’t always make the wisest choices. I know that if I eat that scoop of ice cream, I’m gonna have to walk further on the treadmill that day. For someone who doesn’t like to exercise, that is great incentive not to indulge very often. Small changes, adding steps each week – something thats easy to follow, no counting calories, just watching the steps on your pedometer. It’s working for me and I feel better than I have in years.